BENGHAZI, Libya - An airstrike intended to thwart Muammar Qaddafi's forces killed 13 rebel fighters in eastern Libya instead, the opposition said Saturday, but they described it as an "unfortunate accident" and stressed it did not diminish their support for the international air campaign. Opposition spokesman Abdel-Hafidh Ghoga said the slain fighters were hit Friday night as they moved forward, attempting to take back the oil city of Brega, while airstrikes were in progress. Seven fighters were injured. Ghoga said it was an example of the lack of coordination in the ranks that has proven a key obstacle to victory over the more organized Libyan military. "This unfortunate accident was a mistake that was caused by the rebels' advance during the coalition's attack," Ghoga said. "Now the military leadership that has been organized more effectively recently is working on preventing the recurrence of these accidents." Rebels in the field had previously said some of their comrades were killed by an airstrike Friday but Ghoga's comments provided the first confirmation. NATO spokeswoman Oana Lungescu said the alliance was investigating, and appeared to suggest that its aircraft on patrol had encountered ground fire and had retaliated. "The exact details are hard to verify because we have no reliable source on the ground," Lungescu said. "Clearly, if someone fires at one of our aircraft they have the right to defend themselves." Mohammad Bedrise, a doctor in a nearby hospital, said three burned bodies had been brought in by men who said they had been hit after firing a heavy machine gun in the air in celebration. Idris Kadiki, a 38-year-old mechanical engineer, said he had seen an ambulance and three cars burning after an airstrike. Rebels told The Associated Press that the fighters were hit by about 12 miles east of the town of Brega, which has gone back and forth between rebel and government hands in recent weeks. Opposition spokesman Mustafa Gheriani called the airstrike "collateral damage." "As regrettable as it may be, we understand that we might have to give up lives for the greater good. We have to look at the bigger picture," he said. "This is a war and the lines are so fluid going back and forth, so it's natural that mistakes will happen." NATO, which on Thursday took over what had been a U.S.-led military campaign to stop Qaddafi from attacking his own people, also is investigating whether other airstrikes have killed civilians in western Libya, as the Libyan government claims. On Friday near the front line, at least six people were reportedly killed and 25 injured, including children, in an explosion after a NATO airstrike hit an ammunition truck, reports CBS News correspondent Elizabeth Palmer. The United States, meanwhile, was ending its role in combat missions Saturday, leaving that work for other nations. 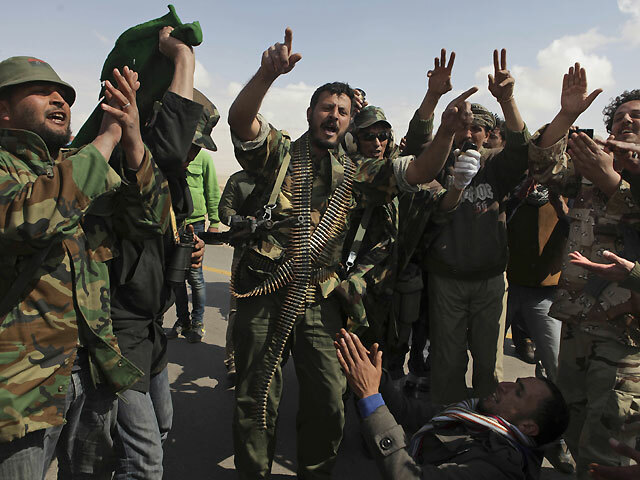 The loosely organized rebel force had been acting in a more disciplined fashion in recent days. On Friday only former military officers and the lightly trained volunteers serving under them were allowed on the front lines. Some were recent arrivals, hoping to rally against forces loyal to the Libyan leader who have pushed rebels back about 100 miles this week. The greater organization was a sign that military forces that split from the regime to join the rebellion were finally taking a greater role in the fight after weeks trying to organize. It was too early to say if the improvements will tip the fight in the rebels' favor. They have been struggling to exploit the opportunity opened by international airstrikes hammering Qaddafi's forces since March 19.